This is one of the most important works of Shri Mahaprabhuji. In this granth Shri Vallabh has laid the foundation of Pushtimarg. 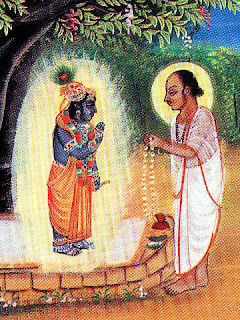 Shri Vallabh took birth in this world to take back the daivi jivas (pure souls) to the heavenly abode of prabhu - Gauloka. But on coming to earth Shri Vallabh became worried that jiva is full of vices (doshas) and prabhu is so pure, how can both be associated because there is no way to make a jiva nirdosh (pure) for meeting God. During his second Prithvi Parikrama Shri Vallabh was in Gokul and on the 11th day of the bright half of Shravana month he was lying down at Govind Ghat but he was very much engrossed in the above mentioned problem. There Shri Thakorji himself appeared and promised Shri Vallabh that he will accept jiva initiated by Shri Vallabh or his descendants through 'Brahma-sambandh' mantra, irrespective of the jivas failings or impurities. Shri Vallabh has described the whole episode, word by word, in the grantha 'Siddhant Rahasya'. Shri Vallabh initiated Shri Damodardasji as the first vaishnav of Pushtimarg the following morning. Impurities mentioned in the Vedas and world are 1) By Birth 2) Place 3) Time 4) Circumstance 5) Physical contact. All the five doshas (impurities) are not counted after taking Brahma-sambandh. Dedicated souls (Brahma-sambandhi jivas) should perform all actions & activities by first dedicating them to God, this should be the way of life for a bhakta (devotee). Any article which we had used previously should never be offered to God as it is considerd 'Swami-Bhukta' (half-eaten/used).